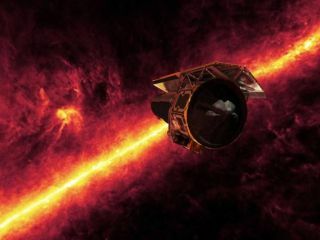 An artist's impression of NASA's Spitzer Space Telescope, which took the infrared image in the background. What will NASA choose for its next major space mission? The hunt is on! NASA has begun a quest to select its next big instrument to study the cosmos. Observatories such as the Hubble Space Telescope have revolutionized humanity's view of the cosmos. And upcoming projects, such as the James Webb Space Telescope (JWST) and the WFIRST-AFTA mission — which the agency aims to launch in 2018 and the mid-2020s, respectively — promise to make big discoveries of their own. One of the four mission concepts is focused on direct imaging of the surfaces of exoplanets, to potentially search for signs of life. The other three concepts are for space telescopes built to detect specific wavelengths of light: the ultraviolet/optical/near-infrared range, similar to what Hubble sees; X-ray light; and far-infrared light. The space agency is now accepting applications from scientists to join one of the four groups. Paul Hertz, director of NASA's astrophysics division, delivered a town hall talk at the 227th meeting of the American Astronomical Society in Florida earlier this month, in which he announced the formation of the groups and put out a call for applications. The groups will put together a report that will show what kind of science each concept could accomplish, what capabilities it would have, what limitations exist for building it, and how each space telescope would benefit the entire astronomy community. Much of the potential science that each mission could accomplish was written about at length in NASA's 2013 Astrophysics Roadmap: "Enduring Quests, Daring Visions: NASAAstrophysics in the Next Three Decades." Here is a brief description of each of the four mission concepts and what they hope to accomplish. This artist's illustration shows some of the planets identified in the Habitable Planets Catalog. A telescope designed to directly image the surface of exoplanets could potentially identify more signs of habitability, or even life, on other planets. Scientists have indirectly identified about 2,000 planets outside Earth's solar system using the Kepler Space Telescope and other instruments. Now, scientists want a way to look directly at exoplanets that aren't too far from Earth. A direct-imaging planetary telescope could potentially reveal the atmospheres and surface conditions of alien worlds, and would search for signs of habitability or even bio-activity (yes, alien life), according to Bertrand Mennesson, an exoplanet scientist at NASA's Jet Propulsion Laboratory in Pasadena, California, who is helping to lead this mission concept group. The so-called "HabEx" mission would "help assess the prevalence of habitable planets and [the] possibly of primitive life in our galaxy," Mennesson told Space.com in an email. HabEx would also allow scientists to look at the atmospheres and surface conditions on all kinds of planets, including ice giants, gas giants and rocky planets, around various types of stars and in various solar system arrangements. Such a telescope would also capture images of young planetary systems in the early stages of formation, providing a look at solar system evolution across the galaxy. Direct imaging of exoplanet atmospheres has already been demonstrated from the ground, Mennesson said. The Hubble Space Telescope, with its 7.9-foot-wide (2.4 meters) primary mirror, has revolutionized how humans see the cosmos. Imagine what a space telescope with a 39-foot (12 m) mirror could do. The star cluster Westerlund 2 and gas cloud Gum 29, imaged by the Hubble Space Telescope. A much larger telescope similar to Hubble has been proposed for NASA's next large-scale mission. "LUVOIR could study the formation of stars and planets in our galaxy, map the evolution of galaxies, illuminate the birth of the first stars in the universe and probe into black hole environments," said Aki Roberge, a scientist at NASA's Goddard Space Flight Center in Greenbelt, Maryland, who is helping to lead the group for this mission. A LUVOIR telescope could also have some overlap with an exoplanet direct-imaging instrument such as HabEx, and would be able to characterize the atmospheres and surfaces of a wide range of planets, potentially identifying signatures of life. These capabilities are discussed extensively in an HDST report that was published in 2015. The galaxy Messier 51, imaged by NASA's Chandra X-ray Observatory. The X-ray universe has already revealed itself to be a strange and beautiful place, through observations (and jaw-dropping images) taken with various space telescopes, including NASA's Chandra X-Ray Observatory, the European Space Agency's XMM-Newton observatory and NASA's NuSTAR mission. A new X-ray surveyor could provide insight into how matter behaves in some of the cosmos' most extreme environments, such as the region around a black hole, proponents say. It could provide a look at the birth and growth of the first supermassive black holes in the universe, and would allow scientists to look at how galaxies have formed and evolved over the lifetime of the universe (13.8 billion years). This backward glance would also reveal a look at the evolution of the larger structure of the universe according to the NASA Astrophysics Roadmap, and NASA scientists working with the concept group. The X-ray surveyor would look out to the edge of the visible universe, allowing scientists to observe how galaxies have formed and evolved over the lifetime of the universe (about 13.8 billion years). This backward glance would also reveal a look at the evolution of the larger structure of the universe. If NASA does end up building the X-ray Surveyor, the mission would provide orders of magnitude more sensitive than any other X-ray mission, the scientists said. An infrared image of the Orion Nebula, a site of massive amounts of star formation, taken by NASA's Spitzer Space Telescope. All the stars in the universe collectively radiate an incredible amount of visible light, but scientists now know that as much as half of that starlight is blocked by dust clouds, and then reradiated as infrared light. "If you don't do things in the infrared, you're missing half the picture, effectively," Kartik Sheth, a program scientist in the astrophysics division at NASA Headquarters, told Space.com. With a next-generation far-infrared space telescope, scientists could study how stars and planets form by studying in detail the nurseries where these cosmic babies come to life. Infrared observations are also especially good for identifying the chemicals present in distant cosmic objects. This could mean looking for water in newly forming solar systems. The vast majority of elements in the universe are made by stars (which means that "we are made of starstuff," as the late astronomer Carl Sagan famously said). A next-generation far-infrared telescope could study stars at various stages of their life cycles to reveal when and where different elements are being made. Effectively, such an instrument would provide scientists a list of ingredients in many cosmic objects, advocates say. The far-infrared mission concept would look at a range of wavelengths that fall between what will be observed by JWST and the ground-based Atacama Large Millimeter/submillimeter Array (ALMA), which is coming online in Chile. This particular range of light gets distorted by Earth's atmosphere, which means scientists must put an infrared telescope into space to capture them properly. The instruments on NASA's Spitzer Space Telescope that captured light in the far-infrared range have all shut down (although a few shorter wavelength instruments are still operational). Following Spitzer's retirement, there will be no space observatories studying the far-infrared wavelength range. The only other observatory operating in this wavelength range is NASA's Stratospheric Observatory for Infrared Astronomy (SOFIA), which is a modified Being 747 aircraft that can fly to altitudes where the Earth's atmosphere is significantly thinner. It is currently the largest airborne observatory in the world. "The far-infrared community has not had a space-mission like Hubble or Chandra that has continuously operated for a long time," Sheth said. Which mission will be selected? NASA invests in missions of various sizes, such as the Fermi Gamma Ray Telescope, or the Wide Field Infrared Survey Explorer (WISE). But the four mission concepts being reviewed by the newly announced working groups will be large-scale missions that follow in the footsteps of Hubble, JWST and WFIRST-AFTA (whose name is short for Wide Field Infrared Survey Telescope-Astrophysics Focused Telescope Assets). Missions of this size take decades to complete, which is why NASA is starting the process now, even though any of these missions might not begin operating until the mid-2030s or 2040, Hertz said. The decision about which, if any, of these concepts becomes a reality will likely be strongly influenced by a group outside of NASA. Every 10 years, the National Academy of Sciences' National Research Council puts together a committee to talk about what priorities the astronomy and astrophysics communities should set for the coming decade. The committee then releases a report, known as the "decadal survey," that makes specific recommendations for the next 10 years. Past surveys have recommended current NASA projects including JWST and WFIRST-AFTA. NASA typically follows the recommendations set by this survey. The four concept groups will work to provide the decadal committee with all the information they need to make a decision about which mission concept should become a reality. One of these mission concepts may inform NASA's next big mission to explore the cosmos.